SMC products address the challenge of providing maximum performance while minimizing energy costs and downtime. The sampling of products below demonstrates how SMC continually innovates to meet the evolving needs of the tire manufacturing process. SMC's airline equipment provides unsurpassed sensing, air regulators and air filtration performance for your pneumatic system. With our large range of pneumatic preparation products, we can provide the clean dry air necessary to achieve the peak performance required by your fluid power system. Our connectors simplify the plumbing of all your components. SMC's innovative one-touch and uni-thread one touch fitting technology provides dramatic time savings during the installation of both air fittings and pneumatic flow controls. We offer many variations and sizes to suit any application. Tubing is made in several sizes and packaged in a variety of lengths. 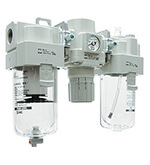 Vacuum generator units, vacuum cups, vacuum buffers, vacuum sensor switches, fittings and vacuum instrumentation solutions allow the broadest utilization of technology and performance to meet your design specifications. Most options are modular allowing you to add only those that are relevant to your application. SMC vacuum cups are available in many different materials, sizes and shapes, and include options like stroke buffers to ensure that a perfect fit is made for each application. The diverse performance characteristics of SMC vacuum products allow utilization in a wide array of applications from manufacturing, packaging, assembly, to material handling. Precision combined with performance and a full line of accessories offers a comprehensive engineering solution to meet your specific need. Standard design and dimensions make the media valve series a simple replacement valve. SMC's direct operated 2-port solenoid valves have improved durability and double their service life due to the unique construction. Built-in wave rectifier results in a quiet operating series of valves that is suitable for a wide variety of applications. Series CS2 air cylinder is a double acting, non-lube air cylinder. Aluminum die-cast is used for both the rod and head covers, which means a maximum weight reduction of approximately 50% (basic 125mm bore, 100mm stroke). This series is available in bore sizes 125mm, 140mm and 160mm with maximum strokes up to 1600mm (depending on the mounting configuration). Air cushions are standard on both ends. Other options include auto switches, rod boots, and Rc, NPT or G thread types. 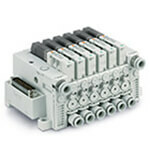 Electric actuators offer distinct advantages over their pneumatic counterparts. Acceleration and speed are controlled and predictable. Multiple positions are possible with high precision and repeatability. Pushing forces can be programmed. With no need for compressed air, infrastructure and energy costs are lower. LE is SMC's current line of electric actuators, designed with a focus on easy setup and operation. Function parameters come preset, plus an "Easy Mode" setting option allows you to be operational quickly. The LE line is available in a variety of types including: sliders, rod and guided rod, slide tables, rotary, grippers, and miniature. 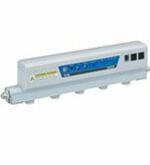 Accessories include actuator controllers, and gateways. Pneumatic products need special lubricant, seal material and design considerations to withstand elevated temperature applications. SMC offers solutions that deliver performance in the extreme temperatures as high as 150°C.